There are billions of searches carried out every day by people planning holidays and looking for hotels. 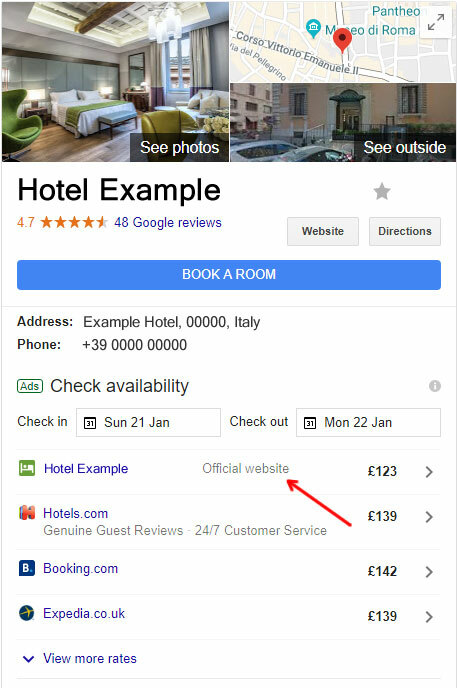 Google wants to contain everything travellers need to book a hotel in a simple Google search results; a single page delivering everything from availability and rates to the booking process itself. That's exactly what Google Hotel Ads delivers. Amongst Reviews, location, hotel facilities google hotel ads main feature is to show travellers all the different sales portals and has allowed smart hotelier to gain massive visibility to sell direct through their Official website and avoid large OTA commissions. Google Hotel Ads is a major step forward in the realm of hotel search and appears to offer significant benefits for independent hoteliers. We recommend all independent hoteliers invest some time in Hotel Ads. We'll certainly be continuing to keep a very close eye on the platform and investigating integration options.